If you follow me on my social networking platforms you will have seen/read/heard I haven't had the best start to the year but I'm slowly getting myself together and I must say; it's good to be back! Whilst I was in hospital one of my all time fave brands launched a plus size range - River Island launched RI Plus and I couldn't be happier. I have always loved the brand, regularly buying their outerwear, shoes and jewellery. It's made me so happy knowing I can now wear all the clothes! Since launching, RI Plus hasn't let me down. Bright prints, great quality pieces and price points that match their main range. To celebrate the fact they are just an all round amazing brand and to say a big THANK YOU to all my followers for your continued support; I am launching a huge competition over on my Instagram. Head over to my Insta (@Daniellevanier) and check my latest post out. All you need to do is tag your bestie to be in with a chance of winning a styling session with me in their Style Studio (London) and a £250 gift card. Sadly this is only open to UK residents - sorry to my overseas followers! 3. The draw is not open to members or employees or their immediate family of Danielle Vanier, River Island, agents or anyone connected with the draw. 5. Prize draw opens at 9am (GMT) on Monday 27th June. 7. The prize draw will close at 10am (GMT) on Monday 11th July and the winner will be drawn & notified by 4pm (GMT)on Friday 15th July 2016. 10. The Styling Session must take place before 31st August 2016. The date of the session is dependent on the availability of Danielle Vanier & the winner. 13. 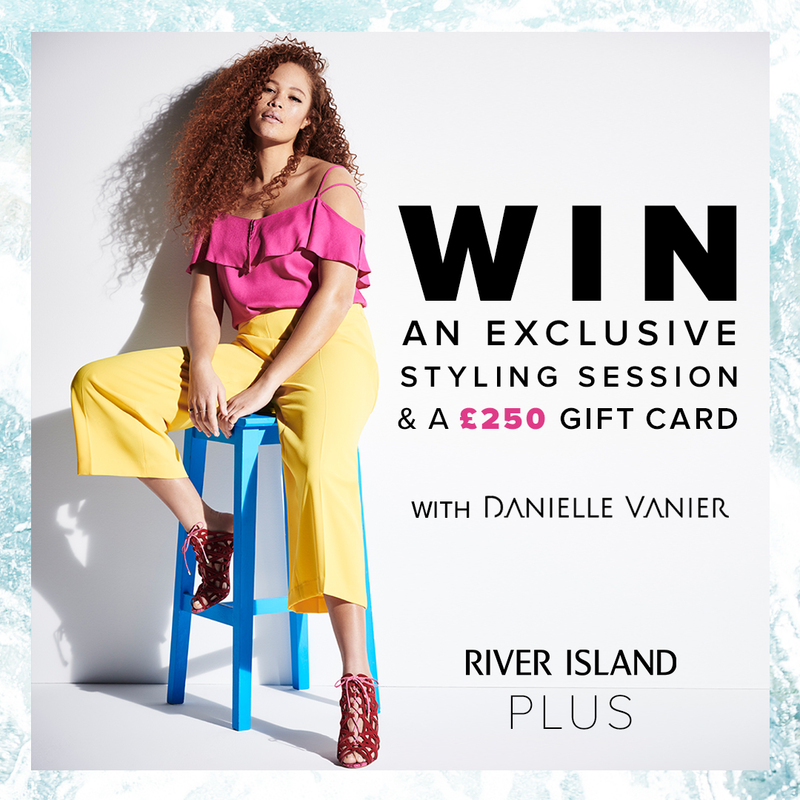 Events may occur that render the prize draw itself or the awarding of prizes impossible due to reasons beyond the control of River Island and/or Danielle Vanier and entrants agree that no liability shall attach to River Island or Danielle Vanier as a result thereof. In the event of this, the prizes may be changed to a similar alternative of the same cash value. 14. Incomplete entries will be disqualified. 15. Winner may be required to take part in post-event publicity. 16. By submitting an entry entrants acknowledge and accept these terms and conditions. 17. River Island’s decision is final and no correspondence or other communication will be entered into regarding the draw other than as specifically contemplated in these rules. 18. The name and county of the winner will be available until December 2016 and can be obtained by sending a request and return SAE to the Marketing Dept at River Island’s address below. 19. The PROMOTER: River Island Clothing Co. Ltd, Chelsea House, Westgate, London, W5 1DR. The Promoter is a registered data user under the Data Protection Act 1998. No provisions of these terms & conditions shall affect any statutory rights of entrants. “River Island” is the registered trademark of River Island Clothing Co. Ltd.
Good luck, Ladies and I am so looking forward to meeting and helping to style one of you! Life is all about good and bad experience...i was hurting REAL bad when my husband left me but now i can't really believe that i am with my Ex-Husband again and With this little short time and just want to use it in thanking the great man that brought joy back to my life within 48 hours by bringing back my lover. Yes it was true that i had some difficulties with my lover but today i am back here to tell the world that Dr.goodluck brought my lover back to me. I have always heard of love spell but i never had an idea of how effective it can be. Well my time is up just contact Dr.goodluck at his email goodluck05spellcaster@gmail.com and you can also whatapp him or call with his mobile +2349059610309. To enable you have a taste of his great work..